This hamlet of half-a-dozen or so cottages was finally abandoned (after years of declining population) towards the end of the 19 Century. 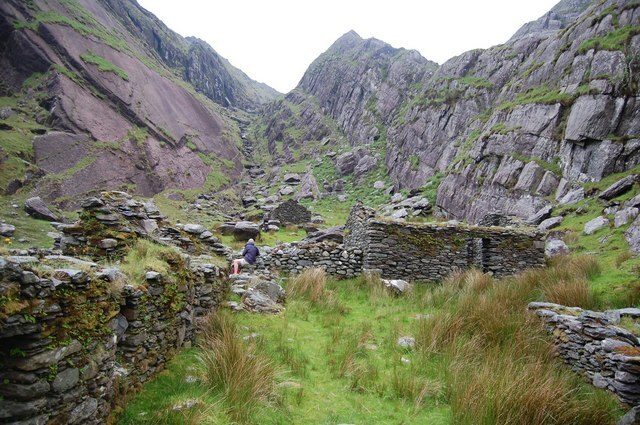 The hamlet, marked on Irish OS maps as "The Pocket" lies at the bottom end of the gully (seen in the photo)coming down from the mountainous ring which surrounds three sides of the valley. Behind me is a small flat area, crossed by a stream, where signs of old cultivation (of potatoes etc) are still to be seen. © Copyright Trevor Harris and licensed for reuse under this Creative Commons Licence.